Begin by speaking to Veldaban the Dwarf Commander in Keldagrim. Firstly, speak to Commander Veldaban to learn that the Red Axes have left Keldagrim. Tell him that you wish to help him, and when he asks if you know where the Drunken Dwarf lives, answer yes. 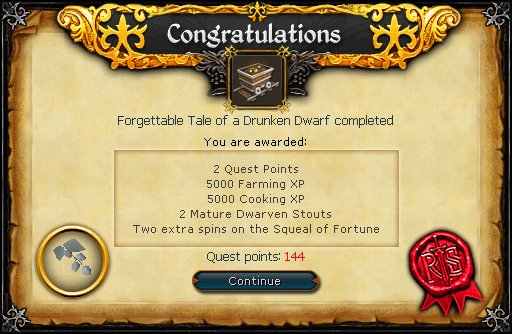 You'll now see a cutscene and afterwards be taken to the Drunken Dwarf's house. Ask him if he knows anything about the Red Axe and he'll ask you to get him some "Good Stuff". Head south to the Laughing Miner Pub. Talk to the Barmaid and buy a beer for 2gp. Go back to the dwarf, and he'll say that it's not good enough. He will then tell you that you need to make a Kelda Stout using 4 Kelda seeds. He'll give you a Kelda Seed and tell you to ask the other Dwarves for the others. Head south to the pub (south of the Drunken Dwarf) again, and find the Rowdy Dwarf walking around. Talk to him, and he'll say that he wants something in exchange for a seed. Hand him the item he asked for, and you'll receive another Kelda Seed. Head to West Keldagrim and go to the pub south of the bank. Talk to Guass, and he'll give you a seed if you drink a beer with him. Talk to the Barman, buy a beer for 1gp, talk to Guass again, and he'll give you your third Kelda Seed. 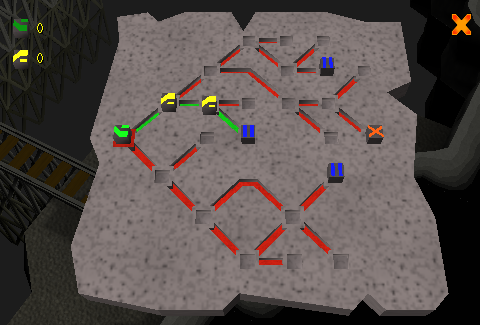 Go back to East Keldagrim and go to the cart station to the South. Buy a ticket to White Wolf Mountain, and board the cart on Track 4. Talk to the Conductor at the White Wolf Mountain and ask for Kelda Seeds. He'll tell you to ask someone further down the tunnel. Go into the room near the track, and talk to Khorvak The Dwarven Engineer. Borrow his seed. You'll now have all 4 seeds! Catch the cart back to Keldagrim. Walk to West Keldagrim, and near the main building that connects East Keldagrim and West Keldagrim, you'll see a Farming Patch. Ask Rind the Gardener for permission to use his patch. Once you have his permission, rake away the weeds and plant the Kelda Seeds (gives 11 farming exp), and wait for them to grow. Compost and Watering Cans are NOT needed. When harvesting them, they give 10exp. You can either wait for your seeds to grow, or you can do a job for the Gardener. He wants you to take a letter to Elstan the Gardener at the farm south of Falador. You can do this while you wait. 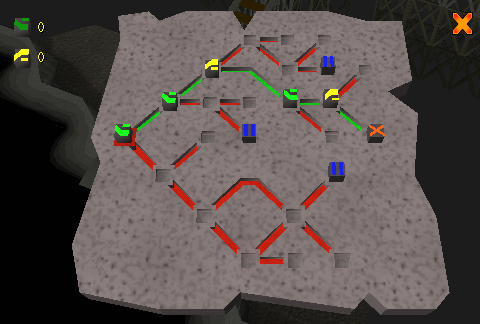 The reward for doing this is 2 Herb Seeds. Once you've picked the seeds, you'll have some Kelda Hops. Head to the Brewery above the pub in East Keldagrim. Now pick up the pot on the table, and buy some yeast from the dwarf for 25gp. Now use your two buckets of water with the Fermenter. Then add 2 Barley Malts, then the Kelda Hops and finally the yeast. Wait for the ale to mature, then once it has, turn the valve. This should take about 5-10 minutes. After that, use an empty beer glass with the barrel next to the vat to get a glass of Kelda Stout. Now head north back to the Drunken Dwarf's house and give him the Stout. He will tell you about the Red Axe. You also decide that you will go to investigate. Head southeast to the Cart Station, and talk to the Conductor closest to the boarded up tunnel. Ask him about it, he'll say it was an old mine, and he doesn't have the authority to let you through. 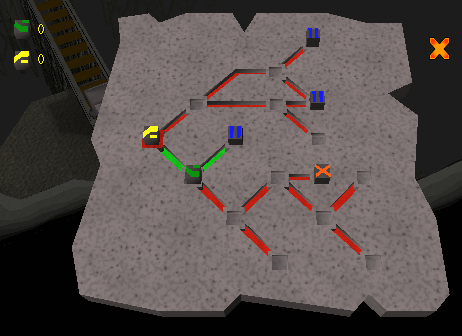 Go to the main building that connects East Keldagrim and West Keldagrim, and talk to the Director of the company you chose during the Giant Dwarf Quest. Ask the Director to open up the tunnel, then go back and ride the cart into the tunnel. Note: Logging out from this point on means that you will need to start the puzzle over. 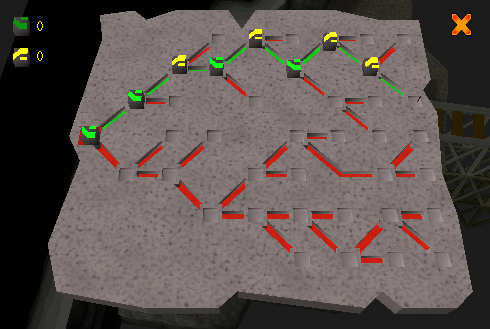 You'll now be in a massive underground area with a puzzle. Search the box to get a green and a yellow cube. Now click on the Machinery. Now your aim is to get to the orange X. The blue || means a box with more cubes. Get the machinery to look like This Diagram. Ride the cart, and once you stop, search the box and go back to the start. Now get the machinery to look like This Diagram. Ride the cart again and search the box when you stop. Go back to the start and get themachinery to look like This Diagram. Jump in the cart (for the last time for now) and ride it for a bit. You will be in a room with members of the Red Axe. You will hear them discussing about how they bribed the boatman to crash into the statue during the Giant Dwarf Quest, and about how they want you killed by an Ogre Shaman. You will be crouching on a higher area. Crouch to the other side, and enter the cave entrance. 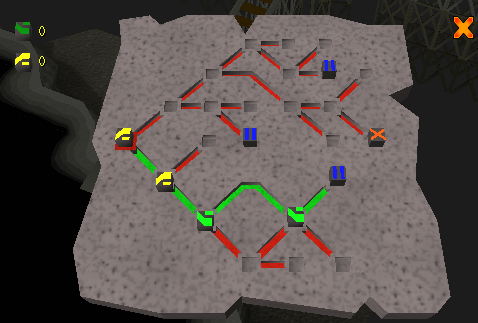 You'll find another mine puzzle. Search the box for the blocks and get the machinery look like This Diagram. Search the box for another block and ride the cart to the start. Get the machinery to look like This Diagram. Again, search the next box for a block, ride the cart back to the beginning, and get the machinery to look like This Diagram. You will now be in a room with bookcases and crates. Search a bookcase, and read the entire book. Search the crate in the middle of the room and read the letter, detailing about the "accident" during the Giant Dwarf Quest. Next, search the crate to the east. It will tell you what happened to the Drunken Dwarf: they cast a spell on him to wipe out his memory, and make him want to eat Kebabs and drink Beers. Now go to the east cave entrance. The third cart puzzle, This time without any || markings! Search the box for the blocks, and get the machinery to look like This Diagram. Search the box for some more blocks, then ride the cart to the start. Get the machinery to look like This Diagram. Again, search the box for another set of blocks and ride the cart back to the start. Get the machinery to look like This Diagram. And this is the last puzzle. You'll see a cutscene on how the Chaos Dwarves were created, and then an Ogre Shaman serving the Red Axe will find you and cast a spell on you! Note: Once you're back in Keldagrim, it's safe to log out. After that, speak to Commander Veldaban. 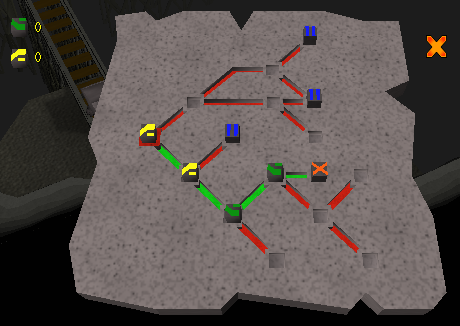 Head to the Laughing Miner Pub in East Keldagrim and buy a beer, then go to the Kebab shop north of the pub and buy a kebab. Go back to the pub again, and eat the kebab. If it doesn't work, keep trying. Eventually you'll be in the bar acting drunk with the Dwarves. This scene is rather funny to watch, as your character says some things to make a fool out of themselves. Shortly after, you'll see a short scene with Colonel Grimsson. 2 Herb Seeds, if you helped the farmer deliver his letter. 5,000 Farming experience 5,000 Cooking experience 2 Mature Dwarven Stouts - adds more to your Mining and Smithing than ordinary stouts.